New playground for Jacob Park! Please complete the online survey to indicate your preference for Option One or Option Two below. Our Jacob Park application to the Chicago Plays! 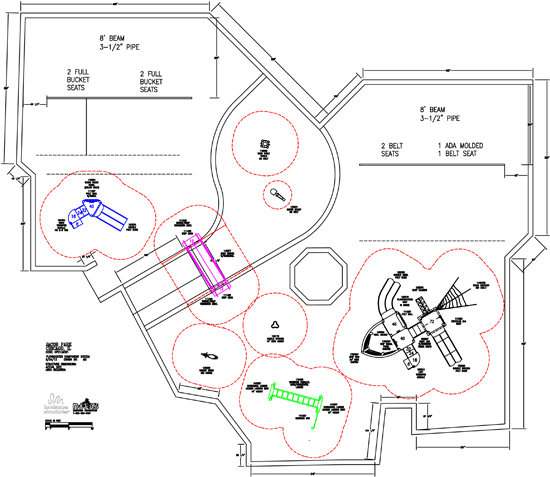 playground renovation program was selected by the Park District and Friends of the Parks last month. 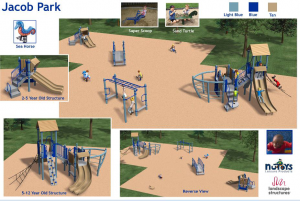 Two different playground equipment manufacturers have prepared custom design concepts for Jacob Park, and the Park District would like our feedback on our preferred option within the next week. Visit the Friends of Jacob Park facebook page at https://www.facebook.com/groups/jacobpark/ and let us know what you think! Chicago Plays! 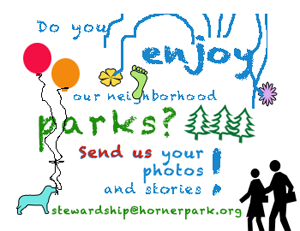 is a program of the Chicago Park District, conducted in conjunction with Friends of the Parks. 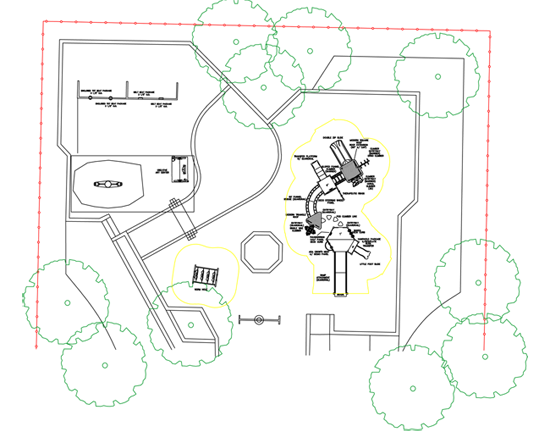 Jacob Park’s application was selected as one of 35 parks to be renovated in the first year of the program. The Chicago Plays! program covers 100% of the cost of new equipment and replacement wood chips within the existing footprint of neighborhood playgrounds. Good news everyone! 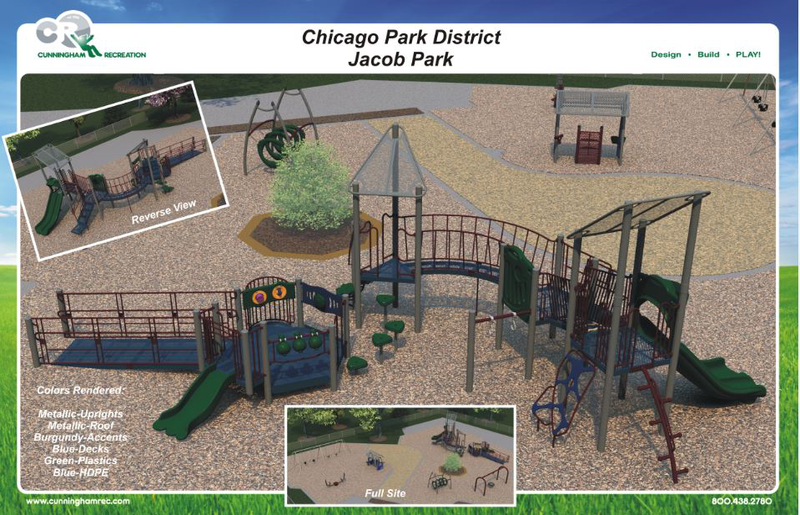 We have just received the official word that Jacob Park was selected to be one of the first recipients of a new playground through the Chicago Plays! program. Special thanks to Aldermen Pawar and O’Connor and their respective staff members for their support of our application. Thanks as well to the Horner Park Advisory Council, the Greater Rockwell Organization, the neighborhood residents and business owners who helped gather signatures for the signature, and of course Tom McManamon and his team at Horner Park. We’re all looking forward to great improvements at Jacob Park! 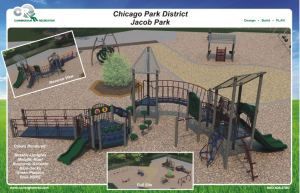 The Friends of Jacob Park has applied for a much-needed playground renovation from the Chicago Park District and Friends of the Parks’ joint Chicago Plays! program. You can show your support by joining the Friends of Jacob Park on Facebook.